The Vilar Performing Arts Center (VPAC) welcomes the harmonious duo Penny & Sparrow on Monday, November 2 at 7:30 p.m. Penny & Sparrow are American singer-songwriter duo of Andy Baxter and Kyle Jahnke. Previously roommates, the duo makes music influenced by The Swell Season, Bon Iver, Mumford and Sons, and others. Single tickets to Penny & Sparrow are $20 and are on sale now at the VPAC Box Office (970.845.8497/ www.vilarpac.org). The VPAC is located under the ice rink in Beaver Creek Village (68 Avondale Lane, Beaver Creek, Colorado). There’s something incredibly haunting about Penny & Sparrow. Maybe it’s the bold, oft heartbreaking honesty behind the lyrics they write. Maybe it’s the union of two voices that sound destined to harmonize with one another. Maybe it’s the fact that these guys are so scary good with little but a guitar and a couple sets of vocal chords—and the thought that they don’t need anything else to make sincere, effortlessly stunning music. Andy Baxter has a voice you suspect could fill an auditorium, but he’d just as soon let it float from a chapel rafter or out a barn door. 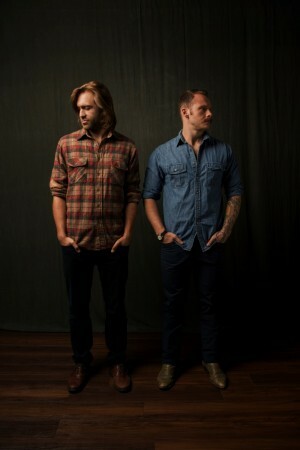 The Texan singer/songwriter is half of Penny & Sparrow, with guitarist Kyle Jahnke his erstwhile guitarist and musical partner. Formed in 2011 after living as roommates at the University of Texas, they began their musical endeavor as a hobby and creative outlet. Their first album, 2013’s “Tenboom,” made great bedfellows with the likes of Mumford & Sons, Bon Iver, and even Iron and Wine, full of quiet spaces and palpable introspection. Their first tune, “Creature” was recorded in a small apartment behind an orphanage with one microphone and a laptop. “If you listen closely, you can hear kids screaming and laughing in the background of each song,” says Baxter. “After just one song, we knew writing and recording was something we didn’t want to stop doing.” Through the years, Penny & Sparrow has steadily grown both in discography and audience. The latest album by Penny & Sparrow, “Struggle Pretty,” was released Spring 2014 and is no different, but perhaps it’s a shade more soulful and solid. Baxter is an ace lyricist, and he wears his heart and self-criticism like a badge: “I’m not proud of me/So how could you ever be?” and “I wanna learn to hollow out” are a few of the moving moments here, delivered with a brokenness that’s not yet beyond repair. “Bread and Bleeding” feels like a big radio tune waiting in the wings, with soaring, swelling guitars and strings, effervescent percussion, and tidal cellos reflecting bouts of hope. Quieter moments like “Rattle” and “To Haunt, to Startle” hover in the air on muted tympani and piano, strings quivering with uncertainty—a near-flawless collection of intimate, beautiful music. The album was written and recorded inside the East Austin house that Andy and Kyle, along with their wives, lived in together. “Struggle Pretty” is vast with instrumentation and creativity, while still staying true to the harmony-centric roots found in “Creature” and “Tenboom.” Kyle and Andy teamed up with producer Chris Jacobie for the album, who helped capture the spirit and sound of the duo. From the somber “to haunt, to startle,” to the sweeping “Bread and Bleeding,” each song has its own voice within the album.